The Atlantic Nicaraguan coast is wonderful and charming. The two autonomous regions of the Caraibic coast of Nicaragua are spread on almost 1/3 of the country surface. It is a wild area subject to deforestation due to the increasing immigration of the populations from the Pacific zone. The autoctonous inhabitants of this region are the Sumus, the Mischitos and the Ramas. Africans and people of mixed Afroindigenous culture live on the coast. This part of Nicaragua was occupied by the Spaniards and today it keeps a strong English presence Communication difficulties with the remaining parts of the country contribute to preserve great social, economic and cultural differences. The Coast leads such a separate life from the the rest of Nicaragua that speaking about the Coast is like speaking about a different country. Actually the people living on the Coast use to call the ones settled on the Pacific the"Spaniards". The Coast, as Incer states, is a little multietnic and multilingual Babel where English, Creole and Spanish are spoken. Moving across the area is not easy; a great amount of the difficulties existing at the times of the colony are present even today : thick forests, wide meandering rivers, a very damp,rainy climate and, as a consequence, lack of easily viable roads. Doubtlessly people ,with plenty of time to organise inland tours in the area, will find here one of the Nicaraguan most charming regions, characterised not only by lanscape variety but also by historical, ethnic and cultural complexity. The two autonomous Atlantic Regions formed, till a few years ago, the big Zelaya department. It was about the 50% of the surface of Nicaragua. From 1988 this very enormous territory was divided into two autonomous regions; Atlantic North (RAAN) and Atlantic South (RAAS), the border between the two region are the Rio Rio Prinzapolka an the Rio Grande de Matagalpa. 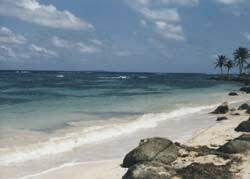 The Carribean shores of Nicaragua, were discovered by the admiral Cristoforo Colombo in 1502. In these time the Atlantic Coast was a very inhospitable land peopled by native tribes.